Vanton CHEM-GARD® CGC close-coupled, end suction thermoplastic centrifugal pumps are ideal for the dependable transfer of acidic, caustic and ultrapure chemicals when space is critical, and corrosion and contamination cannot be tolerated. 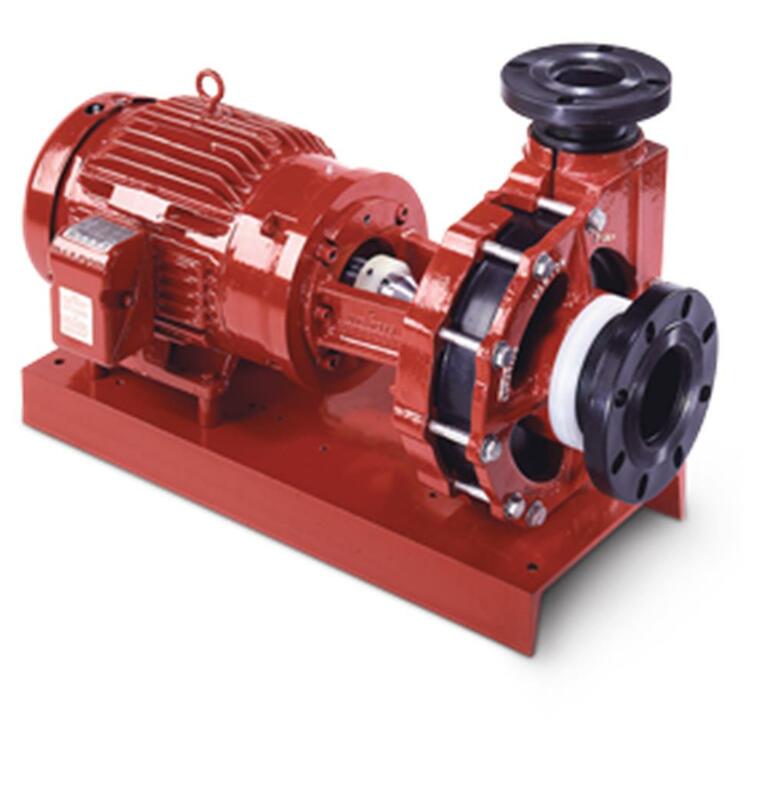 Ideal for retrofit and OEM applications, these pumps are approximately 20 percent shorter than long-coupled pumps, allowing installation in restricted spaces, while eliminating corrosion and fluid contamination associated with pumps constructed of stainless steel, wicking associated with fiberglass pumps, and delamination associated with plastic-lined metal pumps. All pump components in contact with the fluid are injection molded of solid, chemically inert polypropylene (PP), polyvinyl chloride (PVC) or polyvinylidene fluoride (PVDF), including virgin natural and pigment-free thermoplastics to assure the integrity of high purity water, chemicals, pharmaceuticals and semiconductor fluids. Solid, thick-sectioned thermoplastic casings are additionally protected by structural metal armor, enabling CGC pumps to withstand the same nozzle loadings as metal pumps. Vanton CGC pumps are available in your choice of tangential or centerline discharge that allows removal for maintenance without disturbing existing piping. Their innovative construction includes a pump shaft assembly completely independent of the motor shaft, minimizing maintenance and extending motor service life. Pump casing and cover molded from virgin, homogeneous thermoplastic. Stainless steel, large diameter shaft with wet end completely isolated from fluid contact by non-metallic sleeving. Pump accommodates standard single and double mechanical seals without modification. Seals are reverse mounted with non-metallic seal component inboard to avoid any metal-to-fluid contact, making it unnecessary to use costly high alloy or exotic metals. Metal armor totally encloses thermoplastic casing and flanges to provide nozzle loadings comparable to those of metal pumps. Dimensions and specifications subject to change and may vary slightly with motor manufacturer selected. 60- and 50-Hertz performance curves and metric dimensions are available on request. For higher horsepower and operating speeds consult factory. vortex heads, magnetic drive and foot-mounted pumps.